Enzymes are active components of living bio-systems that are crucial to life. These active agents are made of complex proteins and are involved in nearly every metabolic action performed in the body. Enzymes are manufactured by the body, but this ability diminishes as we age. Further, enzymes are depleted by stress, illness and over-consumption of cooked foods. By design, we should obtain enzymes for restoring the body's supplies from fresh raw foods. Cooking destroys enzymes in foods rapidly. Further, today's fresh produce is usually raised on soils that have been depleted over time of important minerals, which are needed for plants to form their enzymes. Thus the food supply is enzyme-deficient. How long ago was it picked. Dr. Edward Howell did research on enzymes and their importance in the body, beginning more than 70 years ago. He endeavored to get the message out for the rest of his life. His books Enzyme Nutrition and Food Enzymes for Health and Longevity are classics. Dr. Howell points out that there are two aspects to the body’s needs for enzymes: digestion and metabolic activities. For many years the health food stores and many natural health-oriented doctors and other practitioners have offered what could be called the traditional digestive enzyme supplements. These usually contain: pancreatin, pepsin, pancrealipase and bile, all from animal sources, along with betaine hydrochloride from beets, and perhaps papain from papaya and bromelain from pineapple. These help people digest somewhat better, but have limited effectiveness. Pepsin requires strong acid to be formed in the stomach, whereas pancreatin works best in a very narrow alkaline pH range of 7.8 to 8.3. The pH in the stomach is very acid, which would destroy pancreatin unless it is specifically buffered. Furthermore, the 7.8 to 8.3 pH is not often achieved in the upper intestine of most people. Actually, poor pancreatic secretion is not usually the major problem, according to Dr. Howell, but rather the lack of enzymes for pre-digestion in the upper stomach, which leads to imbalances the rest of the way along the digestive tract. About thirty years ago, advanced plant-derived enzyme concentrates were brought to the U.S. market. These were based on Dr. Howell’s work and an Asian breakthrough in enzyme concentration methods. These can be more effective than the enzymes in traditional formulas because they work in a broader pH range, generally from about 5 to 9. A few products work from as low as a pH of 2 to as high as 12. Enzymes are complex molecules, vital catalysts that are needed for every chemical reaction in the body. There are two major types of enzymes -- metabolic and digestive. Metabolic enzymes assist bodily functions. Digestive enzymes work to break down proteins, fats, carbohydrates and sugars into smaller, readily absorbable components, building blocks the body requires. Naturally grown raw foods contain the enzymes necessary to break food down to the essential nutrients the body needs, but if it is old when we process, refine, overcook, or microwave our food, most if not all enzymes are rendered useless. Including enzyme supplements in a daily diet restores the body’s natural enzyme supply, and supports energy levels and immune system function. As many as 170 MILLION Americans rely on nutritional supplements to help improve or maintain their health. Much of these go right down the sewer un-utilized, with many of the benefits unrealized. The primary reason is the commonly poor state of the digestive system. THE MOST BASIC STEP THAT CAN BE TAKEN IN REGARD TO IMPROVING HEALTH IS TO INSURE THE DIGESTIVE SYSTEM WORKS RIGHT. If you eat cooked food, you cannot digest it fully well without enzyme supplementation when you eat. An enzyme supplement usually contains proteases for breaking down proteins, amylases for digesting carbohydrates, and lipase for fats, perhaps with other specific enzymes. These may include cellulase for the cell structures (cellulose fiber) of vegetables; maltase, an amylase that breaks down the type of sugars found in cereals, breads and other grain flour products; invertase for starches; or lactase for lactose milk sugar. If you have any sore area in the stomach or esophagus such as an ulcer or gastritis, you should avoid any enzyme formula containing protease for a time. Protease can irritate such sore spots where the protective mucosal lining is missing. The protease treats the area like raw meat as it tries to digest it. Meanwhile there are herbs that are soothing to such inflamed areas of the digestive wall, including aloe vera, slippery elm and marshmallow root. Once these problems have been cleared up, a formula with protease can gradually be introduced. Ultimately the protease is needed for the protein foods in the diet. With a good quality enzyme formula, which can work in a broad pH spectrum, you can be sure that digestion will take place as it is supposed to. Food that is held in the upper stomach for an hour before moving on, will be digested as much as 75% before progressing, instead of spoiling, as is commonly the case. The solution to “acid indigestion” and “heartburn” is not a calcium or aluminum-based drug-store relief medicine, it is supplemental enzymes. With good pre-digestion and appropriate proteases, you can be sure that in the lower stomach the proteins in foods consumed will be properly digested to provide key amino acids at the right time. These are essential in forming neurotransmitters, key chemicals for brain function. The result could be a calmer and more effective nervous system and brain. The appropriate enzymes do more work in the upper small intestine, helping to complete the digestion to insure that each nutrient is available before it reaches its distinct site of maximum absorption in the intestinal wall. If you take extra enzymes with your meals this should help clean excess mucus off of the small intestinal walls resulting in better absorption. With more nutrients available from your food and better absorption of them, you should notice more energy and improved health. A more complete digestion of foods means that there won’t be as much of the gluey residues that derive from several popular foods. In many people such residues have accumulated in layers of sticky waste build-up on the colon wall. If you were to take two bowls of “stick-to-your-ribs” oatmeal and mix the contents of a capsule of a good quality multiple enzymes into one of the bowls, in just a minute you can see the dramatic difference between them. The one with the enzymes will turn rapidly to a liquid state while the other remains a sticky glob. Which would you rather have to move through your intestine? Thus the use of enzymes will make for easier bowel elimination as well. Generally one to four enzyme tablets or capsules should be adequate for most people, depending on the quality of the product, the status of the person’s digestive function, and the size and complexity of the meal. The best time to take enzyme supplements for digestion is after a few bites of food so they mix in and go right to work on the food in the upper stomach. In addition to assisting digestion, enzymes are also essential for numerous metabolic purposes in the body. Virtually every biochemical reaction that happens involves enzymes as a catalyst or an active agent. We’ve heard about enzymes for cleaning clothes or contact lenses. Some of the metabolic functions of enzymes include: cleaning up un-metabolized proteins, carbohydrates, fats, toxins and unhealthy micro-organisms in the body; reducing arterial accumulations; and helping to reduce painful inflammation and to speed improvement of damaged tissue. 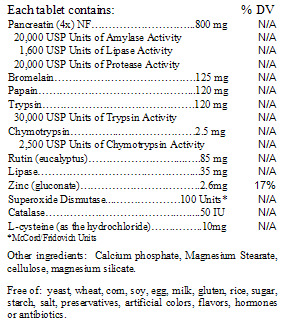 To add extra enzymes to the metabolic pool, enzyme supplements need to be taken apart from food. When taken with food, they go to work on the food. When taken in between meals they can be absorbed right into the bloodstream to work in the body. It should be clear that supplementation of the diet with enzymes is of great value in maintaining optimal health. Inf-Zyme Forte is a specific combination of digestive and anti-inflammatory enzymes, with antioxidants and metabolic cofactors. When taken with meals (or within one hour after), digestive enzymes aid in digesting proteins, fats, and carbohydrates. Their actions help maintain intestinal health and minimize food intolerance. Their absence is associated with multiple food allergies and endocrine imbalances. When taken between meals, the constituents of Inf-Zyme Forte act synergistically to help break the cycles of tissue damage from inflammation. Clinical utilization at the American Biologics Hospital in Mexico has demonstrated proteolytic enzymes to be highly effective in the down-regulation of short-term and long-term tissue degradation in diffuse sites in the body when taken in high doses between meals. In this case, the enzymes pass directly into the blood, are transported to damaged tissues, and produce benefits without the side effects associated with NSAID medications. Inflammation is the body's natural constellation of responses to stress from physical, chemical, or metabolic insults that initiate tissue damage. Paradoxically, inflammatory processes can also exacerbate tissue damage unless they are tightly controlled. The clinical manifestations of Inflammation included burning, swelling, discoloration, edema, and more subtle changes such as the exacerbation of allergies from food intolerance. ~ Lipase breaks down fats; amylase breaks down carbohydrates. ~ Papain from the papaya plant and bromelain from pineapple are robust enzyme complexes that resist degradation from the conditions that prevail in the human digestive tract: both are potent digestants. Bromelain has been extensively tested and found to have prostaglandin regulation properties in addition to its proteolysis enzyme activity. Prostaglandin cascades are centrally involved in inflammation, and by shifting the prostaglandin balance from pro-inflammatory towards anti-inflammatory, bromelain can moderate symptoms and speed the time to recovery. Shortened prostaglandin production influences recovery time. Bromelain also can ameliorate excessive clotting linked to inflammation. One earlier dogma in enzymology was that enzymes are not well absorbed after oral ingestion. Research using state-of-the-art testing and chromatographic analysis has established that enzymes of the type and class of those in Inf-Zyme Forte are indeed absorbed in substantial quantities. It is likely that once absorbed, enzymes are transported in the blood to tissue sites that are inflamed, where they help terminate the inflammatory process. Clinical observations at American Biologics Hospital suggest this product helps the body control inflammatory processes that (if left unchecked) can render the body vulnerable to life-threatening disease. Antioxidants help protect the body's cells, tissues, and organs against free radicals and other oxidative stressors; they are also among the most potent natural anti-inflammatory agents. Free radicals are produced in the body during normal metabolism, but the inflammatory cascades usually generate tremendously greater quantities of free radicals in the affected tissues. ~ Rutin - a bioflavonoid derived from eucalyptus, which is a potent anti-oxidant and anti-inflammatory. ~ Superoxide dismutase (SOD) - an enzyme that is the body's first line of anti-oxidant defense against uncontrolled inflammation. SOD is the only enzyme that processes superoxide, one of the oxygen radicals most over-produced during inflammation. American Biologics states its SOD activity in the internationally-recognized McCord-Fridovich Units. ~ Catalase - an antioxidant enzyme that mops up some of the oxygen free radicals produced down the line from SOD. Catalase, one of the peroxidases, neutralizes Hydrogen Peroxide by the enzyme activity in the clinically-relevant SIGMA units. ~ L-Cysteine - a major antioxidant for the watery phase between the cells of the body, and a building block for the reduced glutathione (GHS) found inside each and every cell. Agents that reduce GSH can cause the cell to die or commit suicide. ~ Zinc (as the gluconate salt) - an essential mineral and a required activation cofactor for the enzyme SOD. Also a cofactor for more than 30 other enzymes, some of which are required for the immune cells to make new cells as recruits in the struggle to get runaway inflammation under control. Inf-Zyme Forte provides 17% of the Recommended Daily Allowance of zinc. Inf-zyme Forte from American Biologics is a combination of enzymes and antioxidants for people requiring supplemental digestive enzymes to aid in the breakdown of proteins, fats, and carbohydrates. It may also be helpful for chronic or acute inflammation. Its ingredients include amylase, bromelain, catalase, chymotrypsin, L-cysteine, lipase, pancreatin, papain, rutin, superoxide dismutase, trypsin, and zinc. If taken as a digestive aid, the recommended dosage is 1 to 3 tablets following each meal; if you use it for other purposes, such as illness, inflammation, and/or injury, take 3 to 6 tablets one hour before each meal or between meals. Inf-Zyme Forte may be taken by persons on sodium-restricted diets. As a dietary supplement take 1-3 tablets daily with meals or 3-6 up to 3 times daily on an empty stomach or as directed by a physician. Refrigeration recommended. IF YOU WANT TO PAY BY PHONE using either your checking account or a credit card or debit card, call us at 330-920-9820 or toll-free at 1- 800-542-1923, 10 am to 5 pm Eastern Time, Monday-Friday.